2005 Vielle Julienne – This is one of my favorite wines – deep red, lush and rich. We still have a bottle of 2004 left and I am savoring the mere thought of opening it. This is the 2005 release. This wine is made from Grenache grapes from 80-100 year old vines and has hints of cherries, pepper and spice. It received 90 points from Robert Parker. 2005 Beaucastel Chateauneuf du Pape Rouge – This wine is quite large and tannic now and needs to age for at least 7-10 years before drinking. It has flavors of licorice, tar and black fruits. It received a 94 rating from Robert Parker. 2005 Esprit d’Henri Muscat – I buy this wonderful muscat each time I visit my friend Guy’s wine cave. It is a Vin de Pay wine – the grapes are grown in Languedoc. It is sweet without being too heavy. It pairs well with foie gras and with fruity desserts. It is also great with a nice bleu cheese. Sensational! 2005 Domaine Marcoux – This wine is made by two sisters using bio-dynamic methods. The grapes are: 80% Grenache, 10% Mourvedre, 5% Syrah and 5% other. The wine is exquisite with tastes of blackberries, cherries, licorice and currants. Although it is young, it is drinking beautifully now. 2004 Peres de l’Eglise Heritage La Calice de Saint Pierre – This wine is made of 80-90% Grenache grapes, the rest is Syrah and Mourvedre. The grenache grapes are from vines that are more than 100 years old. The bold wine is lush with tastes of ripe plums and currants. It received a rating of 92 from Wine Spectator. 1999 Domaine Grand Tinel Alexis Establet – Composed of 90% Grenache from 85 year old vines and 10% other varietals, this wine is aged 12-18 months in old and new barrels. It was suggested that we open the wine 3 hours before drinking. It is quite tannic initially but when allowed to open it becomes more balanced and the richness of the fruits comes through. Tastes of dark berries with a bit of mineral on the finish. 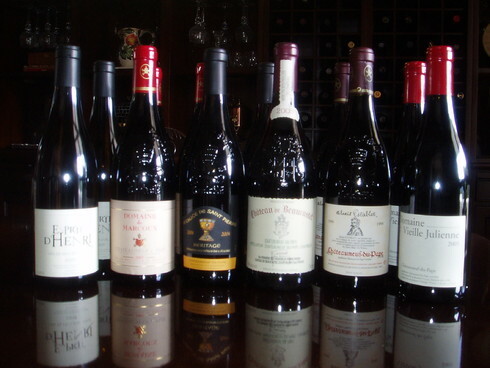 These wines are all available (can be ordered online and shipped to the states) from my friend, Guy Bremond, at Cave du Verges des Papes in Chateauneuf du Pape.